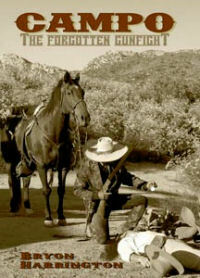 July 14, 2011, (El Cajon) -- Bryon Harrington, local Alpine author, will appear at s meeting of the El Cajon Historical Society on Thursday, July 28 at 11:30 a.m. Mr. Harrington will share stories and sign copies of his self-published book,Campo, The Forgotton Gunfight. See the East County Magazine review here. History buffs will enjoy this true local history of the gunfight which occurred in December, 1875, in Campo--a confrontation that surpassed the famed OK Corral shootout in duration and bloodshed. The Gaskill Brothers faced off against banditos who attempted a daring daylight robbery of the town of Campo. Mr. Harrington became involved in reenactments and is the skit director for the "Hole in the Wall Gang." After many years of research, he set out to write about the Campo incident and is now sharing his accomplishment.